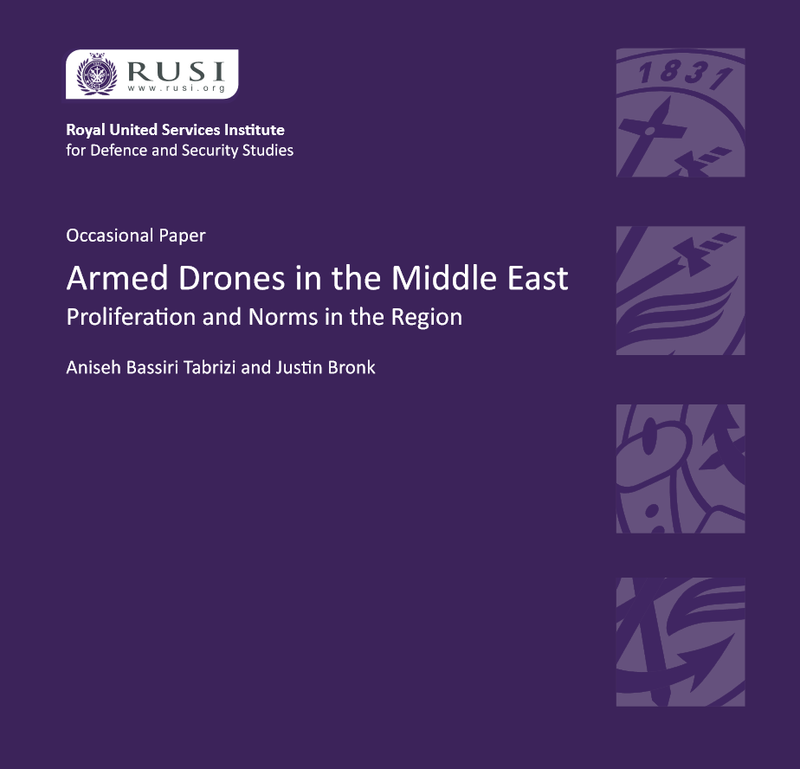 Early December 2018, the UK-based think-tank RUSI released a new paper on the proliferation of armed drones in the Middle East. The launch event of the paper, titled “Armed Drones in the Middle East Proliferation and Norms in the Region” took place at Whitehall in London, and was well attended by a range of policymakers, journalists, and civil society experts. The authors of the report presented their findings and highlighted a number of key issues from the report, which informed the ensuing debate with the audience. The report is supported by a user-friendly online database, https://drones.rusi.org/, where you click on the specific countries and see what types are in use and where the drones are coming from. The paper outlines China’s growing role as a drone exporter to the region, and it’s industry trying to get a foothold with national industries. A significant number of states turned to China for the acquisition of armed drones, as the US did not want to sell armed drones to this region. The US’ concern is mainly driven by the fear of reverse engineering and the desire to protect its military technology. Though the role of China was previously also reported upon by news outlets and research publications, the RUSI paper provides more details on specific types of drone exported, and on how these importing states are using them in their military or counter-insurgency operations. Iraq has already deployed Chinese drones in their operations against the so-called Islamic State, while unconfirmed reports raised suspicions that the United Arab Emirates have deployed armed drones in two countries: in Libya against armed groups, and in Yemen in support of the Saudi-led coalition. Turkey has it’s own armed drone industry and has actively used armed drones in support of its operations against the Kurdish People’s Protection Units (YPG) in Afrin, Syria, where they backed the so-called Free Syrian Army (a group consisting of different extremist groups), and possibly also in strikes against the Kurdistan Worker’s Party (PKK) in south-east Turkey and northern Iraq. In their analysis, the authors made a choice to focus only the type of drones as classified by the Missile Technology Control Regime (MTCR). Though understandable, this also limits getting a better understanding of the export of smaller types of military drones that fall below the MTCR threshold. The Arms Trade Treaty and it’s associate export-control list based on the UN Registry of Conventional Arms would perhaps have been a better reference point to assess drone proliferation, as this builds on a wider definition of unmanned aerial vehicles (UAVs), as is argued by the Stimson Centre. Notably absent from the report was Egypt (geographically Africa, though often considered part of the Middle East) which operates drones, and the fact that the UAE has its own military drone industry. The strong part of the presented research is the engagement with government officials and experts which helps highlight the military and strategic thinking among key persons involved in drone use and export decision making. With more than 100 states having military drones, of which at least 20 have armed drones, military thinking about using unmanned and remote controlled systems in military operations is rapidly evolving. The military industry has been aggressively pushing for more funding, be it in the US, the EU, Asia or the Middle East, while upcoming states with military drone industries are now focusing on the middle segment of the military drones. While the paper states that China sees drones as an ideal tool for counter-terrorism, there are reports that indicate the opposite. Though they may not have any issue with other states deploying them for this reason. Further, it is argued that the US does not sell their drones because of human rights concerns. Perhaps this is stated by officials, but it does not fall in line with other decisions made by the US on arms exports to human-rights violating regimes in the MENA, such as Saudi-Arabia. More importantly, the US’ own policies of using armed drones for extra-judicial killings paved the way for other states to develop, export or use them. The numerous complaints from human-rights groups and UN Special Rapporteurs about the lack of transparency of, and accountability for US drone strikes demonstrates the hypocrisy of this argument given by US officials. During the debate the authors stated there is currently no sufficient instrument to regulate the export of armed drones, though we would dispute that, given that over 100 states signed the Arms Trade Treaty, which also regulates the export of armed drones. Moreover, we would argue that the MTCR would not be the right instrument for controlling proliferation of armed drones, as it’s limited by scope, has no legally binding function, and does not provide the stage to engage with States on their practices of using armed drones. The latter is highly needed, as the report makes a strong case that more and more States express interest in acquiring, developing and deploying armed drones. The question now is: how to ensure the export is controlled a way the ensures the upholding international law principles around their use and how can we build an meaningful international norm around the use of remote-controlled violence.